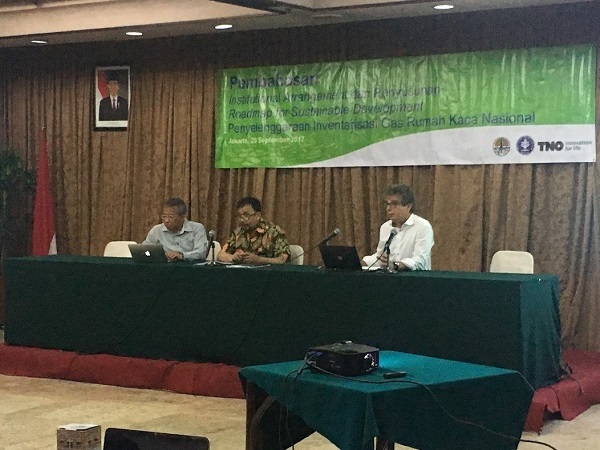 As follow up of the Netherland Government cooperation toward Indonesian Greenhouse Gas (GHG) Inventory development, CCROM-SEAP and TNO supported by the Directorate General of Climate Change (DGCC) Ministry of Forestry and Environment Indonesia (MOEFI) conducted a one day workshop on 29 September 2017 at the Ministry of Forestry and Environment Indonesia. This workshop focused on the discussion of Institutional Arrangement and Roadmap for Sustainable Development of National GHG Inventory. This workshop invited various stakeholders from Energy, AFOLU, and Waste sector. Prof. Rizaldi Boer opened the workshop with presentation topic of Strategy and Steps to do National GHG Inventory that Reliable and Accurately. Peter W.H.G Coenen from TNO also gave a remark to the all audiences related with Good Practice of GHG Inventory in Netherland. The presentation session was ended by the explanation of GHG Inventory on One Emission Data policy by Dr. Joko Prihatno (Director of GHG Inventory, DGCC). The workshop session continued with gap mapping activities which involved Policy Maker, Technical Staff and Researcher of Emission Factor Development, and followed by the Focus Group Discussion (FGD). Through this workshop, it is expected that participants from all sectors have the same perception related with the GHG Inventory activity data collection, emission factor development, one national data policy and institutional arrangement.